French poet and essayist Yves Bonnefoy has died at the age of 93, local media report. One of France’s most esteemed modern poets, Yves Bonnefoy published more than 100 books translated into 30 languages. Yves Bonnefoy was also a translator who was known for his French versions of the plays of William Shakespeare, and the poetry of W. B. Yeats, John Donne and Petrarch. His style was surrealistic to a degree, but he sought to avoid the obscurity which might isolate his readers from the everyday world. 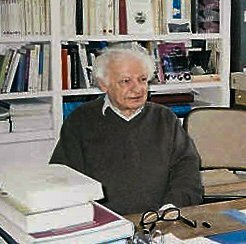 Born in 1923 in Tours, Yves Bonnefoy was also an art critic who wrote on such modern masters as Pablo Picasso, Alberto Giacometti and Piet Mondrian. He also translated the works of his friend, the Greek poet George Seferis. Yves Bonnefoy published his first volume of poetry in 1946 and first achieved wider fame seven years with his third book. He said that in his poetry he tried to seek “what is immediate in life” by staying faithful to the “truth of language”. Yves Bonnefoy taught comparative poetics at the prestigious College de France from 1981 to 1994, as well as teaching at a number of US universities.